Happy Holidays from Surreywood Swim Club! We hope everyone had a wonderful Thanksgiving! We are so thankful for another year as your neighborhood Pool and Community Center. We are especially grateful for the 79 neighbors who contributed to our Capital Campaign and member challenge which brought in an additional $11,000. Maintenance for our 2018 season will include the resurfacing all three pools at a cost of over $63,000+ in expenses, so every fundraising contribution is helpful to our operational and maintenance costs. We’re ready for 2018 Members! In an effort to streamline membership, we have updated our membership types, prices, and online application. This new application should be easy to read and understand, but if you have any concerns please email them to surreywoodpool@gmail.com. We will also accept credit card payments for your membership/payment plan. Please note, there is a $15 fee associated with payment plans and/or credit card payments. Please join us Tuesday, December 5th from 5-8pm for a fundraiser at Pepe’s, located at 9550 Midlothian Turnpike. Pepe’s will donate 15% of the funds raised back to the pool. Plus Pepe’s makes the best burrito’s in town, so it’s a win-win! Let the countdown to NYE begin! Join us for our Third Annual Surreywood Luminary Hayride, December 31st at 6:00pm in the pool parking lot. We will have multiple trailers running, a bonfire, s’mores and hot cocoa. Super Bowl Football Pool Coming Soon! Attention all football fans. Are you ready for the game this year because Surreywood’s Super Bowl Pool is returning with 100 boxes to fill! The 52nd Superbowl will be Sunday, February 4, 2018 in shivery Minneapolis! The deadline to participate in this fundraiser will be Noon, Saturday, February 3, 2018. Be on the lookout for more details after the 1st of the year! If you are looking for a fresh gift that gives back to the pool, please consider buying a wreath or table top tree. Each purchase gives back 20% to the pool, and the fresh greenery is so fragrant and full! Now is the time to order, as the wreaths take about a week or two to produce and ship. Attention all football fans. Are you ready for the game this year because Surreywood’s Super Bowl Pool is returning with 100 boxes to fill! Half of this amount will be donated to the Surreywood Swim and Tennis Club, while the remaining half will be split among 4 winners. As a not-for-profit organization, there is no personal gain involved. A winner will be announced after each quarter. Please drop off your cash or checks payable to the Surreywood Swim and Tennis Club to the Meagher home at 2200 Bloomsherry Drive. A chart with all the names and numbers will be circulated by e-mail before the game. Please provide your e-mail address when dropping off your payment or email rosannmeagher@gmail.com to ensure that you’re on the list. Once ALL 100 boxes have been filled, a non-participant will draw the numbers. This means that the actual allocation of numbers is entirely random and unbiased. The deadline to submit your payment is Noon, Saturday, February 3, 2018. 2017 End of Season Special! Plenty of swimming days left in the season. 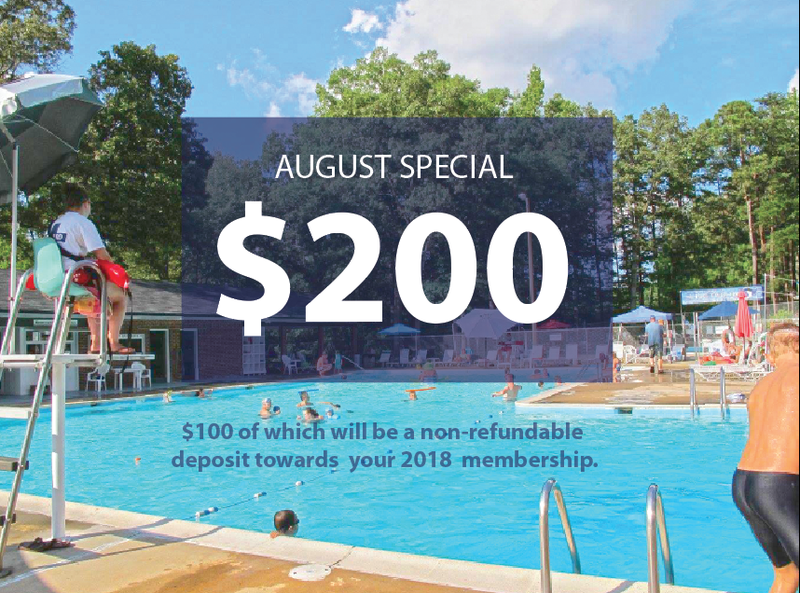 Join for the rest of the season for $200, and receive a $100 non-refundable deposit towards your 2018 membership. Please sign up at the gate. Parade at 10:30 begins at Lancashire and Surreywood Drive. Decorate your bike, car or stroller. Pool games at 2:00pm. Please RSVP and pay the Gate Guard by May 30 at http://bit.ly/swluau. The price is $15/per person and includes a fabulous meal catered by Surreywood’s own Mela Jones of Truly Scrumptious. Plus an adult only cash bar. This is open to all Adults 21+ and will be held in the Lap Pool area. The Surreywood Swim & Tennis Club’s General Membership Meeting for 2016 will be held on Monday evening, November 7, at 6:30 p.m. at Southminster Presbyterian Church. Members please note – this General Membership Meeting is scheduled 1/2 hour before the SCA General Membership Meeting. If you are both a Swim club member and a SCA member, please plan to attend both. What a fabulous pool season we have recently wrapped up. We dread to think the end of summer means the end of visiting with friends and neighbors! Come on Sept 24th to get your BBQ Chicken Platter for only $6 and enjoy a visit with the community you know and love. Please RSVP here prior to Sept 22. Thank you for another great pool season! As you may know, the pool has been fundraising all year to help with major repair expenses that drained our reserves. We were lucky enough to get credit terms to make these repairs and hoped that we would raise enough funds to cover these expenses. Unfortunately, we have not raised enough funds and summer is almost over. While we have a brick fundraiser that is helping contribute to our repair bill, we have only sold a dozen or so bricks at this time and desperately need to generate the cash to pay these bills. As such the Diamond Membership was born! This is a great opportunity to get us cash in the bank account, while offering an incentive towards the generous members who are able to do so. With this membership, we are asking for a member to pay in advance their 2016 (full price) dues multiplied by four, to cover 2017-2020, and your membership in 2021 will be free. This will not only lock in your member pricing over the next four years but it will significantly help the pool get out of our debt and back into sunny skies. We hope you will consider becoming a Diamond member. And if not that you can contribute any amount to our capital campaign fundraiser or by purchasing a family or business brick. To request a diamond membership invoice, please email us or contact Shirley Houck by submitting a request for an invoice online here. Be sure to read below for all the fun things we will be doing this summer down at the pool! Lots of upcoming events, including our 4th of July activities that you won’t want to miss! Our Capital Campaign to help pay for the emergency repairs to the pool is continuing to slowly build. We have now raised 45% of the funds needed to pay off our loan. We are still continuing to fundraise and accept donations; any amount is helpful! Pamela McCartt will be teaching a 4 week Parent and me class on Thursdays from 5:30 to 6:00 beginning on June 30th and ending on July 21st. The cost is $20 for the 4 weeks. Reserve you spot and sign up by paying the gate guard. All proceeds go to the pool. Parent and child will love these fun, game-filled, 1/2 hour lessons. Positive reinforcement helps the child enjoy the water, never forcing the child to submerge. This class is an excellent introduction to the pool and preschool lessons. Hang out and splash with your friends at the pool after dark! Parade: Meet at the Intersection of Lancashire Dr. and Surreywood Dr. by 10:30 am. Decorate your bike, wagon, scooter, stroller or car and parade with us to the pool! Silent Auction: Bids open at 11:00 am and close at 3:00 pm. We are still collecting items for our auction, so if you are willing to solicit donations or donate a gift card, basket, service or item yourself, please drop off at the pool by Sunday. Raffle: $5 tickets are being sold for a beautiful original 8×8 watercolor of your home painted by Surreywood’s own award winning artist, Glynn Brannan. Tickets can be purchased at the front desk at the pool anytime between now and the raffle at 3:00 pm on July 4th. Games: Join us at 2:00 pm for fun and games in the pool! The Stingrays will be hosting their last home swim meet vs. the Granite Marlins on Tuesday, July 5th at 6:00 pm. On swim meet days, the lap pool closes at 2:00 pm and the L-pool closes at 5:00 pm, however, our members are welcome to swim at the opposing team’s pool that night. If you want to find out what swim team’s all about, come on down and cheer on our team! There is no charge to watch the swim meet. There will be goals the children can reach for, according to their age, as well as suggested donation amounts to shoot for collecting. There will be awards for those who complete their goals, as well other prizes. All money raised goes to benefit the pool! The swim will be held on Wednesday, July 13th, at our pool. Ages 12 and under will swim from 4-6pm and then eat FREE pizza and soda. Ages 13 and over will swim from 5-8pm, followed by the FREE food. Visit our website for more information and entry forms. NEW THIS YEAR: There will be Parents/Adult Challenge goals so adults can participate too! We hope to see you all at this fun and challenging event! Have you seen the beginnings of our new brick walkway? Visit thatsmybrick.com/surreywood to be part of this fun brick paver project! Your children and grandchildren will love coming back to see their names engraved on the patio! best family wins a free guest pass! The swim will be held on Wednesday, July 13th, at our pool. Ages 12 and under will swim from 4-6pm and then eat FREE pizza and soda. Ages 13 and over will swim from 5-8pm, followed by the FREE food. To participate, please download and complete the form attached. NEW THIS YEAR: There will be Parents Challenge goals so adults can participate too!